Hair loss a familiar chemo side effect, but Red Lobster cheese biscuits tasting like lard??? In between tweets the other night I stumbled across this compelling article on "how to counter the side effects of chemo." Hair loss is familiar as a chemo side effect, but Red Lobster cheese biscuits tasting like lard? That’s odd (and unfair)! It got me thinking of all the other possible side effects doctors "neglect" to mention for one reason or another before you start chemo. 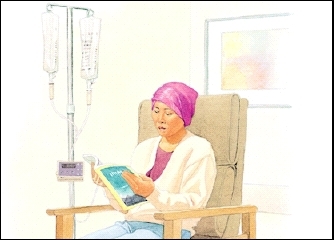 So of course, I posted a tweet in Twitterland: QUESTION: "Anyone doing chemo?? What is one side effect the doctors neglected to mention? Just curious…" I was particularly intrigued by some of the responses. I compiled a short list of the ones I thought might be a little out of the ordinary… "Rotting fingernails!" "I have the port in my neck, they forgot to tell me about if it gets infected and what could happen if they have to take it out" "During chemo, mouth sores are possible. Catsup may seem to burn tongue like hot pepper sauce. Tongue becomes sensitive" "Metabolic rate change. Seems we were always chasing electrolytes, potassium, magnesium, etc" "Since chemo is a metallic (carboplatin for ex.) use plasticware. Metal taste, silverware makes it worse Watch for swelling limbs, Lymphedema! The body can't rid fluids properly." "My mom's side effects have been more extreme than the docs mentioned; mild diarrhea turned into wearing a diaper" "They forgot to tell me of the HUGE joint and muscle pain I was going to have!" "Drink plenty of water/liquids. Chemo seems to dehydrate. Constipation can be a problem" "One of the side effects that the docs didn't mention is the devastating post-chemo arthritis"
"Short term memory gets clobbered for a while" "Loss of feeling in feet and toes" "That “Chemobrain” is real"